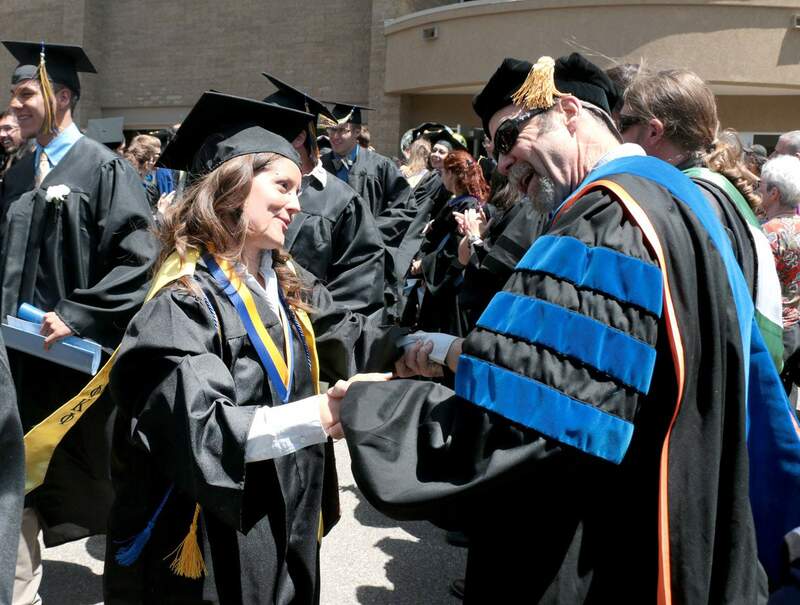 Graduate Hari Baumbach greets history professor Andy Gulliford at the graduation ceremony at Fort Lewis College in 2014. College officials are working to boost enrollment in coming years. 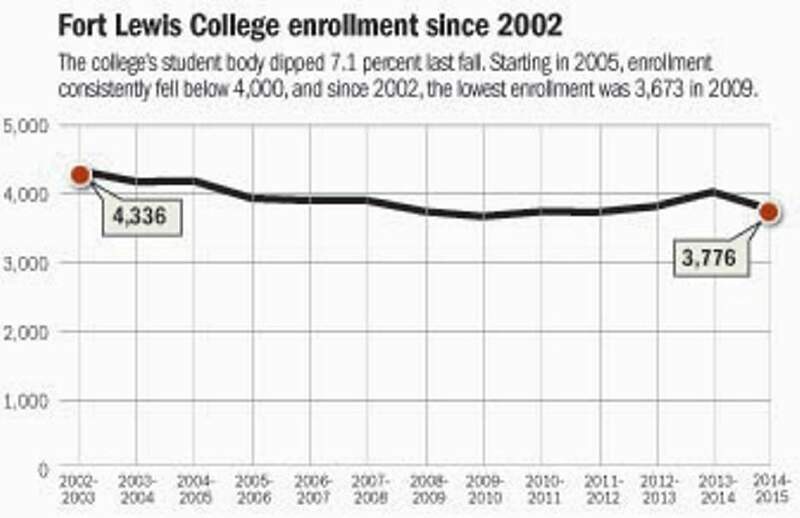 Fort Lewis College officials are working to boost enrollment after a substantial dip last fall. The school has signed a contract to do direct mailing, hired a new recruiter and started doing more advertising. So far, the efforts appear to be paying off. The school received 3,005 applications from potential freshmen as of Friday. By comparison, it received about 2,400 as of the same time last year, said Andy Burns, director of admission. About 600 of those applications have come in over the last three weeks as a result of contracting with Royall & Co. to do direct mailing. Previously, the college staff did similar mailings on its own. While the numbers from direct mailing look good, the college staff also has seen a positive response from other new efforts. “We’re not putting all our enrollment eggs in Royall & Company,” said Mitch Davis, spokesman for the college. The college has invested in advertising on local school buses and Denver High School buses. They also have bought ads in movie theaters, through Google, Facebook and Pandora. So far, Pandora ads have been the most successful at attracting viewers to Fort Lewis’ website. In addition, a new recruiter was hired to focus on Northern New Mexico and Southwest Colorado. This person also has worked to attract students from San Juan College and Southwest Colorado Community College. About 10 to 15 percent of Fort Lewis students normally come from the Four Corners. So far, applications from this geographic region have doubled compared with the same time last year, Burns said. But with six months before the deadline for applications, Burns is hesitant to be overly optimistic. “Even though applications for this territory look positive now, we’re unsure about what’s going to happen,” Burns said. The college staff has aimed to increase enrollment 2 percent each year from 2012 until 2016. But in fall 2014, the college’s enrollment fell 7.1 percent from 4,065 to 3,776 students. Burns said the college is interested in making up the difference this year and is working to attract students interested in the liberal-arts experience and the lifestyle Durango offers, among other factors. Last fall, the college was hit by a large graduating class and a small incoming class. In addition, 35 out-of-state colleges and universities have offices in Colorado doing recruitment, Davis said. “The recruiting landscape in the state and in the nation is getting more and more challenging,” Davis said. This story has been corrected to reflect the correct number of applications from freshmen that the college has received. The number of out-of-state colleges and universities that have offices in Colorado has also been corrected.